Mark Miller, General Manager for Keller America, spoke with Angela Godwin of WaterWorld magazine at WEFTEC 2011.. Mark offered some insight into the Keller organization and on several products that have made Keller a world leader in level and pressure measurement. For more information on which Keller product is appropriate for your application, contact Keller America at 877-253-5537 or email sales@kelleramerica.com. New Keller Manufacturing Process Video! Keller now offers the Digilevel, an SDI-12 level transmitter. This new instrument employs Keller’s proven sensor technology coupled with an SDI-12 serial-digital interface to create a more versatile and valuable tool for environmental level monitoring applications. SDI-12 is a standard communications protocol used to interface microprocessor-based sensors with data recorders for environmental data acquisition. This convertible instrument may be used for either submersible level or bubbler pressure measurement with user-selectable pressure connection caps. The conical cap is designed to promote automatic cleaning of the sensing diaphragm, helpful where the submersible level transmitter is deployed in high-silt conditions. The alternate bubbler transmitter cap provides a 1/8”NPT female pipe thread for connection to the bubbler apparatus. The Digilevel is compatible with all SDI-12 v1.3 commands. In addition, it is capable of operating in several emulate modes for popular SDI-12 level/pressure transmitters including manufacturer-specific extended commands. A graphical user interface and Dongle are available options for those who may be unfamiliar with SDI-12 commands. For more information about the Digilevel, you can view the datasheet here. If you have any questions, please call 877-253-5537 or email sales@kelleramerica.com today. The Preciseline Pressure Transducer (manufactured by Keller-America ), not unlike our EtherMeter, offers a digital Modbus-based solution to a water telemetry problem that was previously solved by analog (4-20mA) instrumentation. Preciseline Pressure Transducer (by Keller-America). In the case of the Preciseline, the water pressure signal is converted into Modbus; whereas in the case of our EtherMeter, error-free totalization and flow-rate data is collected from a compatible flow meter(s) and converted into Modbus . 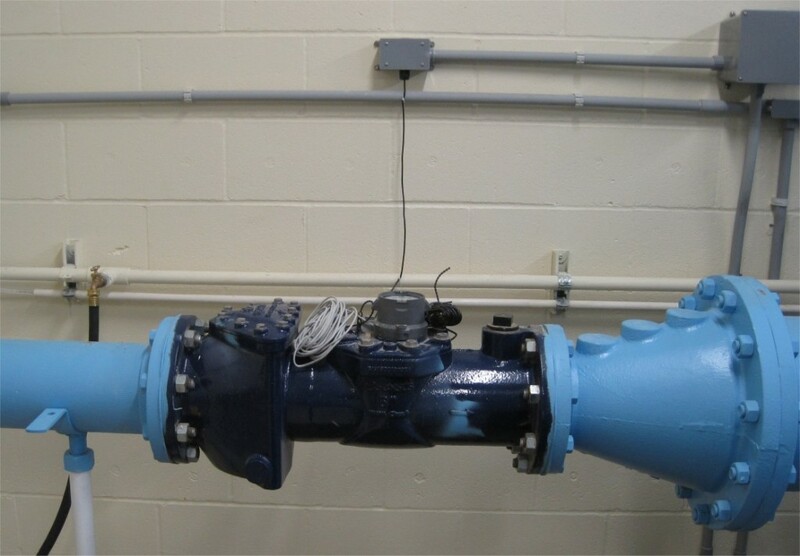 As I/O counts grow and instrumentation complexity increases in water plants and pump stations, the addition of smart Modbus sensors is a natural solution that can simplify control system integration challenges. For example, using a multi-drop Modbus/RTU network, a single shielded cable (+24VDC/Gnd, RS485A/RS485B) can be routed throughout a water plant or pump station to communicate with (and provide power to) an assortment of Modbus-based devices. As an example, Jersey County Rural Water Company (Jerseyville, IL) recently completed construction of a new pumping station at Godfrey, IL. 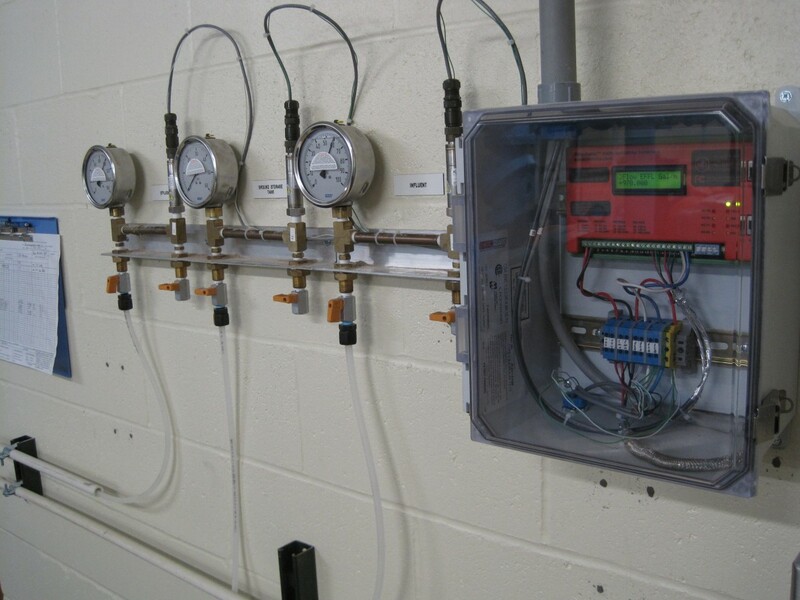 The control system at the station features a Modbus/RTU multi-drop network that communicates to 3 Preciseline transducers which monitor station effluent pressure, influent pressure, and the level of water in the ground storage tank. The same network also includes 2 EtherMeters, which report totalization and flow-rate from 4 flow meters (2 Sensus Omni-T2 meters and 2 Neptune HP Turbine meters). Had this project been addressed using legacy analog methods, then the aforementioned signals would have required 7 shielded cables connected to an RTU via 3 analog-digital converters and 4 pulse-counting channels. Therefore, the use of Modbus may significantly reduce the costs associated with wiring, conduit, and instrumentation. 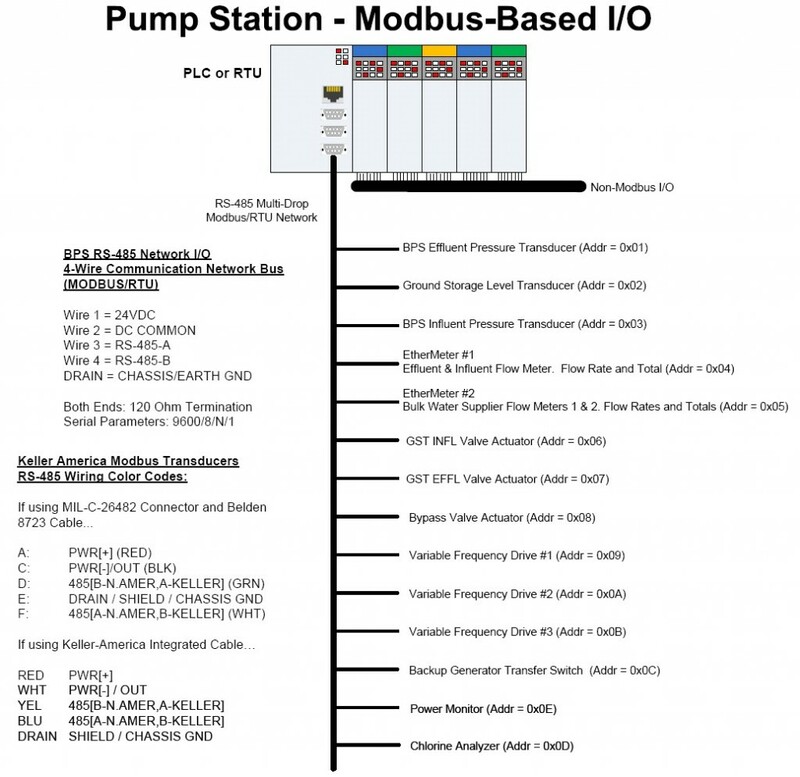 Furthermore, the future addition of other Modbus-based devices is highly simplified. In this application, Jersey County’s potential upgrade plans include tying the 3 variable-speed drives, 3 motorized valves, backup generator, power meter, and Chlorine Monitor into the Modbus network. On 03 Sep 2010, Jersey County Rural Water Co. is hosting a Dedication Ceremony and Open House for the Pump Station featured in this article. The described Modbus flow metering and pressure monitoring technology will be displayed at this event. If interested in attending, please contact Jim Mimlitz at SCADAmetrics (636)938-9633. For further information on the Preciseline and other Modbus-capable pressure transducers, please contact Chris Lilly at Keller-America (757)596-6680. 1) A Trimble Nomad (or similar Windows Mobile1). Micro-diameter transmitter now available in ranges up to 900ft! The Keller Microlevel, the smallest diameter submersible level transmitter in its class, is now available in full scale ranges up to 900 feet of water. For applications that demand high pressure, high accuracy, and small size, the Microlevel is the answer. Contact Keller America today for more information. We at Keller America, Inc. are proud to announce that all products manufactured in our facility in Newport News, Virginia meet the “Buy American” criteria set forth in Section 1605 of the American Recovery and Reinvestment Act (ARRA) of 2009. We have carefully reviewed Section 1605 and can assure all of our representatives, engineers, integrators, contractors, and customers that Keller America products are ARRA compliant and suitable for use on projects where ARRA Section 1605 is invoked. Keller America, Inc. is committed to doing our part to aid the economic recovery by growing our business, building innovative products, and thereby creating jobs for deserving Americans. Keller America is happy to provide OEM/reseller labeling at no extra charge, helping to ensure that follow up business comes back to you. All that is needed is your company logo, contact information (and part number if applicable) in virtually any graphic format with a resolution of 150 dpi or better.